I was going to sit here and blog about death and how Halloween takes death and turns it into something we fear or something that we joke about. I was going to go off on a rant about how horror movies are bad mkay, and that we are trained by society to fear death. Then I thought about it, and thought, that’s just no fun at all. So I decided to share an equation that came to me in session one day. The simple equation below. Let me explain this equation a bit further. See, I work with a lot of couples, and some of them have to work through issues of infidelity, lying and other acts of mistrust. As a result, many of them come into my office looking for a way to rebuild the trust that has been lost. So this is what I offer them. You can not have Trust without Facts, and you can’t have Trust without seeing those facts for a period of Time. Well, this is all well and good, but how can I apply this to my own life? Well its not just as simple as that, is it? There are certain Facts that need to be understood in order for Trust to exist. What kind of Facts are we looking for? The kind that is necessary to ease the emotional distress of the other person. And not just any amount of Time will do, but we have to get specific about the amount of Time that must occur in order to regain this Trust. Let’s make this simple, because I tend to make things more complicated than they actually are. 1. Decide that you want to rebuild the trust between you and the person who broke your trust. You have to decide whether or not you want to rebuild the Trust. This is where it has to start if you’re going to rebuild any trusting relationship. 2. Decide what you can trust this person with, and what you can’t. This separation has the WATER Method all over it. What you can and can’t change and what you can and can’t trust someone with are much in the same. The only difference is that with Trust, you can make a change in what you can’t trust someone with. 3. Give this person measurable goals with which they can rebuild your trust. Decide what you are willing to trade in return for your trust. Take in this process, and really think about what is worth trading for…what Facts and for how long do they need to exist before you feel comfortable trusting this person. 4. Decide to give back that trust. Make sure you make this decision, because if you don’t, you may find yourself wondering why this person is so bitter. I mean, you just made them jump through these flaming hoops, you have to make sure you keep up your end of the bargain. So there you have it. 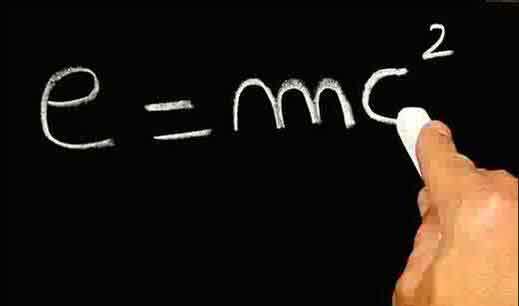 Einstein had E=MC2, Newton had his laws of physics, Freud had his theories. Maybe this isn’t as amazing, but hey, its helped some people Maybe it will help you. Great idea to put trust into an equation. It’s the first time I’ve met presented explicitly the idea of giving somebody goals and build trust depending on how well they fulfill them. Now that I think about it, this IS how we build trust in real life. What a wonderful equation. it’s a great way to improve our life. 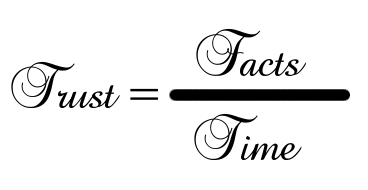 Follow this equation.